Catalog #12262 is shaped to fit in diamond opening. 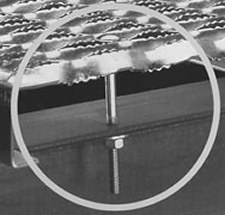 Punched to receive 5/16” carriage head bolt with square shank. Align plank on I-Beam or other anchoring cross-member. Mark the I-Beam for drilling purposes under a slot near the end of plank. Drill a pilot hole. Remove plank and drill a finish hole. Replace plank. 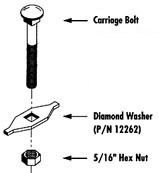 Align diamond washer over the drilled hole. Run bolt through diamond washer and I-Beam. Tighten with washer and nut until secure.